The 9th Highway and Urban Environment Symposium (9HUES) was held in Madrid, Spain, from 9-11 June 2008. HUES is run by Chalmers University of Technology within the Alliance for Global Sustainability (The AGS). HUES was initiated by Professor Ron Hamilton at Middlesex Polytechnic (now University) in the early 1980s and had the title "Highway Pollution". The initial aim was to measure and assess challenges in highway pollution, with a strong emphasis on urban photochemical smog, ozone formation and particle release. After the first symposium, the emphasis on air pollution issues continued through to Munich in 1989 where diesel particulate issues and the relevance to health through measurements of PM10 emerged. The focus on air quality issues was also strengthened. 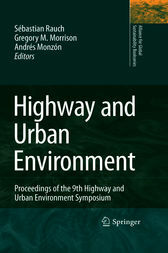 In parallel, the symposium started to receive an increasing number of scientific contributions from the area of urban run off, indeed to the extent that the title of the symposium was changed to "Highway and Urban Pollution". Since then the importance of science in support of policy became increasingly important as a key aspect of the symposium. 9HUES was held at TRANSyT- Universidad Politécnica de Madrid, Spain to provide a professional and scientific forum on global examples of the science required to support pathways to a positive and sustainable future in the highway and urban environment. This volume contains papers grouped by topic on ustainable mobility and management; air pollution; trace elements in the environment; urban water contamination, contaminated sites and treatment; urban climate and climate change.